PHUKET: A total of B7.3 million in insurance payouts has been made to the family of the two Chinese tourists killed when a bus crashed on Patong Hill on July 10. Speaking on Wednesday (July 19), Nipon Banwat, Deputy CEO of Indara Insurance Public Co Ltd, said, “After we received the report of the July 10 accident we collected information and managed the case urgently. “The bus company Jomthien Co Ltd held an Accident Insurance policy with us and according to the policy the family of the deceased were entitled to compensation. “Ms Peng Yali, a relative of the deceased, flew in from China to receive the payment from us today,” he said. “A total of B6mn, B3mn per person, has been paid out to the family,” he added. 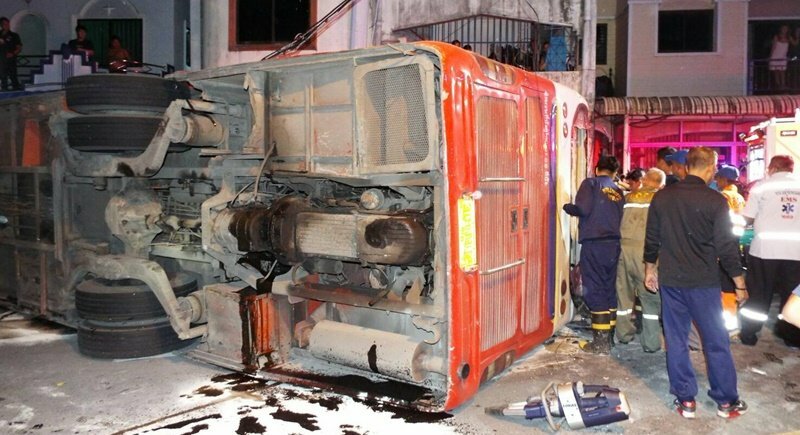 Dr Suthiphon Thaveechaiyagarn, Secretary-General of the Office of the Insurance Committee, added, “We were notified that the Phang Nga registered bus had crashed in front of Suwankeereewong Temple in Patong on July 10 killing two people and injuring 23. “We found that the bus belonged to Jomthien Co Ltd who had a Vehicle Insurance policy with Sin Mun Kong Insurance so we contacted that company,” Mr Sutthiphol explained. “We told them that two Chinese tourists who were killed in an accident on Patong Hill and they advised us that the family would be entitled to compensation of B650,000 per person. “The cover also provided injury cover of up to B300,000 each for injured party,” he added. “Accidents can happen at anytime, anywhere. However, this is more the case in the rainy season because of slippery roads, so people should have insurance to cover the risk. “I want to say to public transport operators to make insurance sure they have the correct insurance cover as stipulated by law, they should also check the expiry date of their policies,” he said. “We are very sorry for the families of the dead and injured, and we can confirm we are helping them as much as we can. “If anyone has any questions then please call our hotline number 1186,” Dr Suthiphon concluded.